Well here we are back into the swing of things and pumping out some good ol’ fashion reviews. Feel like it’s been forever since I posted one. We had so much fun with the contest, even though it was a lot of work getting it all organized. The comments alone were well worth all the work, thanks again to everyone who participated and our wonderful sponsors! So what am I reviewing on my first day back? Well it’s a Curivari Reserva Limitada 1000 Series, a brand I’ve been itching to try for a long time now! Ever since Tony reviewed the Curivari Seleccion Privada awhile back I’ve been dying to get my hands on anything from the Curivari line. Not only that but they seem to have been getting glowing reviews all over the online community. Being from North of the border, it’s always tougher to track down some brands and this was one of them until recently. While at a herf a few weeks ago this cigar was being featured so I grabbed myself a few hoping to squeeze them into a post, and here we are! 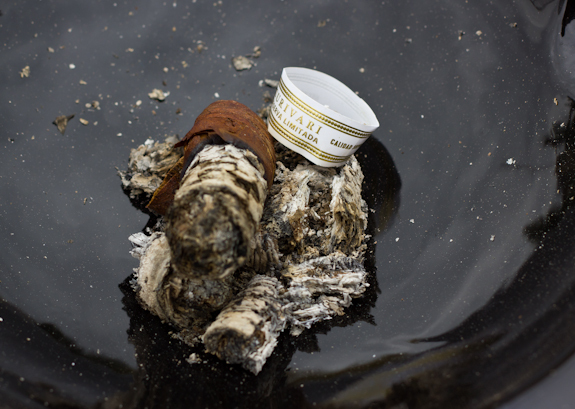 Now in case you’re not too familiar with Curivari, here’s a little background info. They are a Nicaraguan company that is quickly making a splash with an inventory of 4 lines, with one line having 3 blends within it. 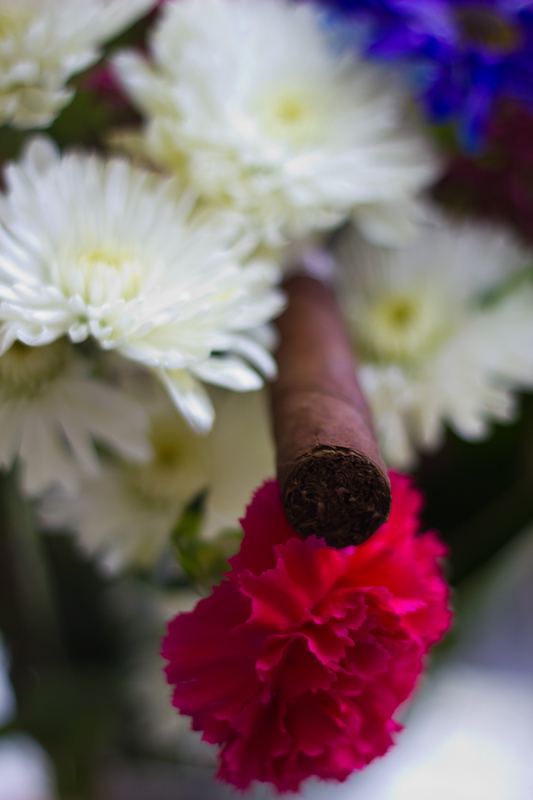 They are very traditional in their growing and harvesting and grow only Cuban seed Crillo and Corojo tobacco. 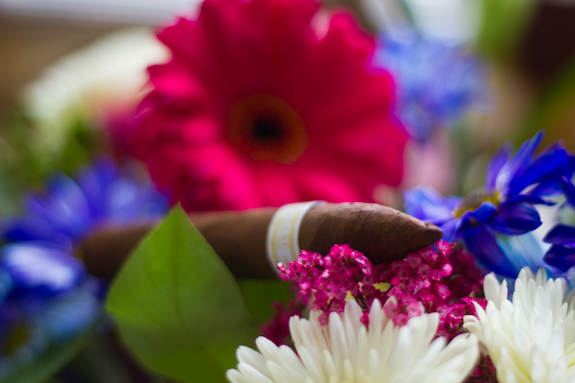 All of their cigars are 100% Nicaraguan Puros and they strive to blend for a classic Cuban profile with excellent balance. 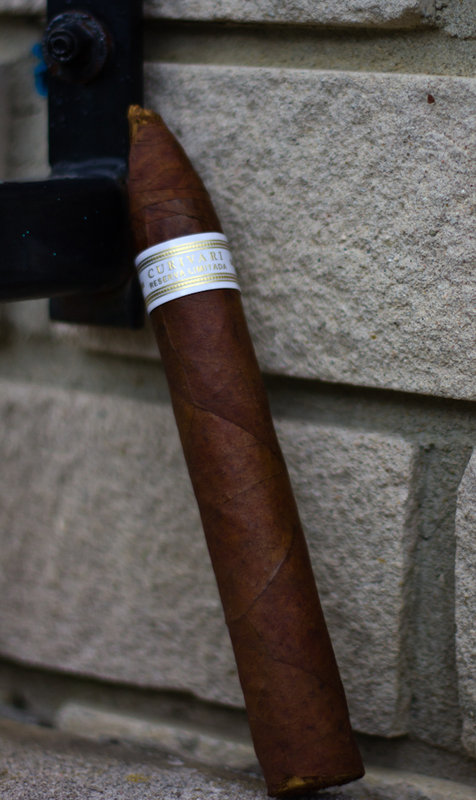 The cigar up for review today is the 1000 Series (or “Thousand Series”) from the Reserva Limitada line. 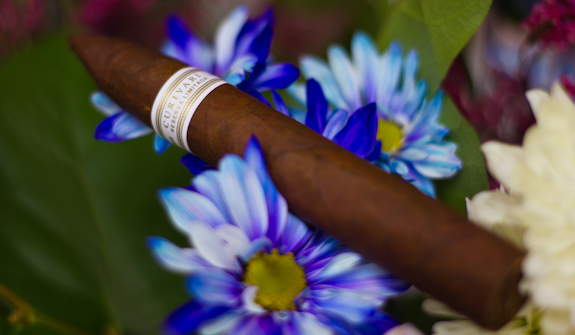 This blend is wrapped with a dark Colorado leaf and comes in 3 sizes, the 2000(Robusto), 3000(Toro) and 4000(Torpedo). I’m sparking this one up on a warm sunny afternoon and hoping the weather holds out since it’s calling for rain. •	The initial draws brought a delicious deep cedar flavor with some cocoa notes and just a touch of baking spices, a great start for sure! I have to admit I thoroughly enjoyed each of these that I’ve had the pleasure of smoking. The unique and complex flavor profile kept me on my toes throughout the whole experience. The burn line wasn’t perfect but it didn’t need me to pay any attention to it and went along without problems. Along with the wonderful flavors it also had a very interesting retrohale that started with spices and finished with a sweet cedar smoothness. 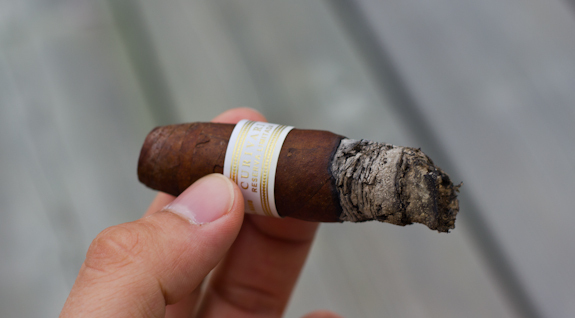 At a price of just about $7 for the typically more expensive Torpedo vitola, this is a great purchase and well worth it’s cost. The Toro (Reserva 3000) can be had for only $6.30 and is pretty much the same size. I will definitely be adding these to my future shopping lists, I’d love to see how age treats them in a year or so! Well no big surprise here, another beer from Innis & Gunn. Have I told you all how much I love their brews before? lol. Well this is another special edition that they came out with called the Highland Cask. Instead of aging them in regular oak barrels they actually age them in barrels that previously contained 18 year old Whisky. They also leave it in there for an extended time totally 69 days. It gives it a very nice touch of whisky malts on top of it’s already delicious profile of creamy caramel and toffee. It’s soooo good! haha. Go buy it if you can find it before it’s gone! 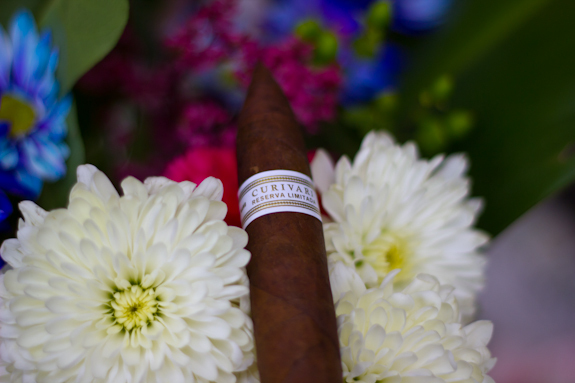 As for a pairing, it was awesome with the Curivari Reserva Limitada. 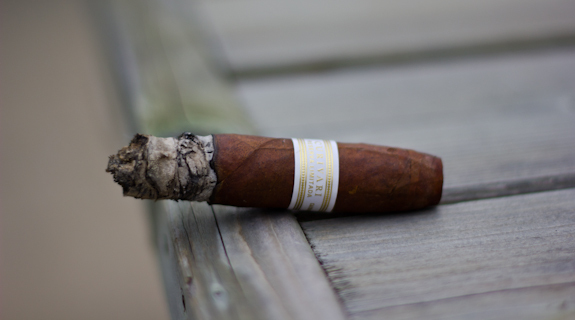 It had just enough flavor to compliment the cigar without overpowering it or being drowned out. 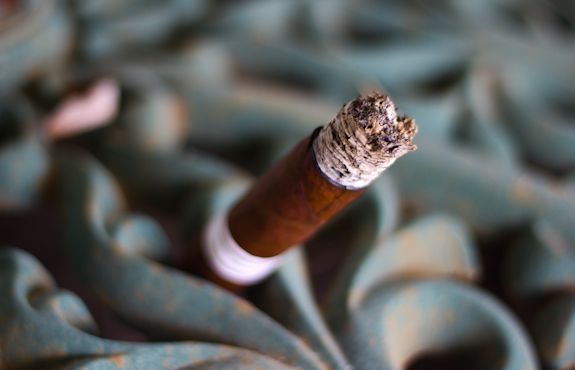 This cigar would also go very well with a nice dark stout, a strong coffee or maybe a nice Belgian Tripel! Great review…had the exact same pairing myself on Tuesday night except mine was the Rum Cask beer. 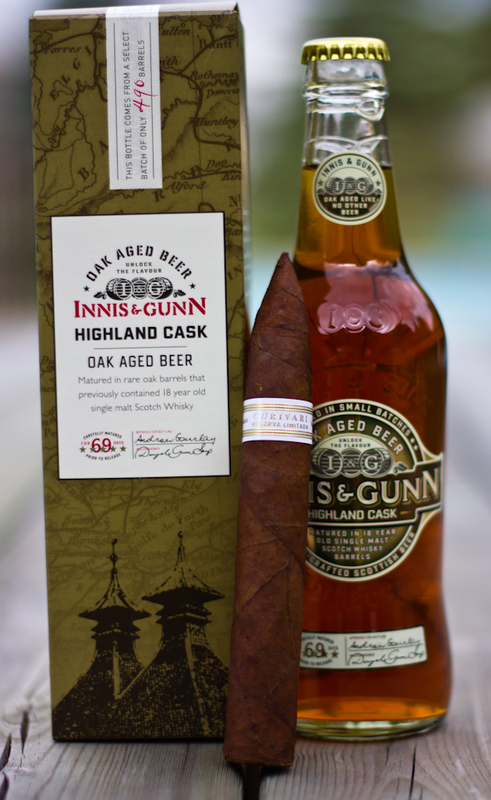 Will definitely be looking to try the entire line…but love a good torpedo and this was definitely one of them! The Rum Cask is darn tasty too, and at least that one is regular production. This limited brew carries a higher price tag with it too. I’m like you and definitely want to see what the other sticks in this brand are like cause this one was tasty! Just got back from the beer store and picked up some La Fin du Monde and some Trois Pistoles…set for the weekend now! haha, Now that you started drinking the good stuff, there’s no turning back! I have to agree with Daniel there. Nice haul! Looks like another one I’ll have to track down sometime, but I don’t think my local carries them. Nice splash of springtime color in the pics, although it hasn’t quite reached that point where I am. Thanks to you and Tony for a fun week of contests, even though I didn’t come close to winning anything lol. Order some of these online, definitely worth trying! I keep putting Curivari in my online shopping cart but always deleting for some reason. Just not sure what line to start with. I’m thinking the Cafe. Good review ! Thanks Michael! I’d love to hear what you think if you get a chance to spark one up! A friend gifted me one of these over a year ago & said it already had a year of aging on it. I’m pairing it with Four Roses small batch bourbon. So far, about 1/3rd into it & I’m getting cedar & spice. Nice!